Zimbabwe have named a full-strength squad led by allrounder Elton Chigumbura for the three-ODI series against Ireland that begins on September 26 in Harare. Zimbabwe last played an ODI series in June and have made just one change to their squad, replacing allrounder Andy Blignaut with Shingirai Masakadza, a seamer and useful lower-order batsman. 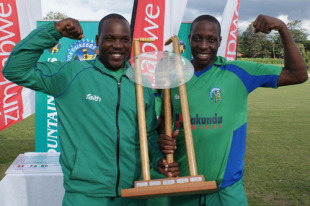 The 15 also includes the experienced Tatenda Taibu and Hamilton Masakadza, who has been a prolific batsman at the top of the order and is in form. He recently starred with 90 and 41 for his domestic team Mountaineers in its win against Mashonaland Eagles in the Logan Cup. Ireland confirmed their decision to tour Zimbabwe in August after the African country had staged Intercontinental Cup fixtures involving Kenya and Afghanistan as well as a tri-series featuring the hosts, Sri Lanka and India in June. Things have been looking up for Zimbabwe in the recent past with former players like Jason Gillespie and Shaun Pollock giving cricket in the country a vote of confidence by taking up coaching assignments with domestic teams. Zimbabwe has been in self-imposed isolation from Test cricket since 2006 when it didn't have the players to field a competitive team, but the country's cricket board recently laid out an 18-month plan to return. However, Zimbabwe did suffer a setback in August when Scotland refused to tour for their Intercontinental Cup game scheduled for October, following government advice that cited insufficient progress in political reform and the rule of law as reasons to stay back. Zimbabwe's most recent ODI assignment was a satisfying one, as they beat India - albeit depleted - twice in the tri-series and qualified for the final, where they were trumped by Sri Lanka. The Ireland tour comprises four games, all at the Harare Sports Club, including an Intercontinental Cup fixture on September 20. Zimbabwe squad: Elton Chigumbura (capt), Graeme Cremer, Chamu Chibhabha, Charles Coventry, Craig Ervine, Greg Lamb, Hamilton Masakadza, Shingirai Masakadza, Chris Mpofu, Ray Price, Ed Rainsford, Vusi Sibanda, Tatenda Taibu, Brendan Taylor, Prosper Utseya.